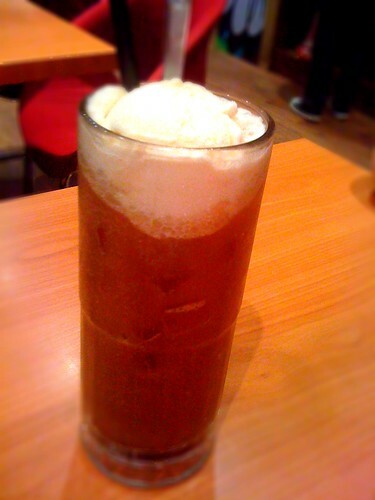 Food on Foot: Root Beer Float @ New York New York! I could still vividly recall my junior college days when a group of classmates would drop in at A&W on Tuesdays specifically for it's discounted Coney Dogs and signature root beer floats served in ice-frosted mugs. Ever since the fast food chain moved out of Singapore many years back, one could still chance upon the occasional root beer floats sold at other restaurants. A recent encounter would be at the New York New York! restaurant @ Heartland Mall Kovan. The drink came in a tall mug topped with the much anticipated scoop of vanilla ice-cream. It was very much a recreation of the signature drink from A&W but nothing beats the real deal - be it the presentation, price (charged at slightly less than $8!) or even the soft drink to ice-cream ratio. By the time I gobbled up the last chunk of ice-cream floating in the drink, the mug was still about three quarters full and this was when I wished the scoop of ice-cream was bigger. So you see, more doesn't mean it's better. It all boils down to proportions! For the younger generations who never had the good fortune of dining at A&W restaurants in Singapore, you might want to pop over at our friendly neighbour - Malaysia - for the real deal!